Your destiny is your choice! 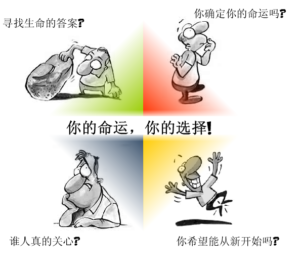 The PDF is a presentation composed of cartoons in Simplified Chinese linking to one another taking you through the necessary steps to help you make a wise choice. The reason why we chose cartoon pictures is because cartoons are a language everyone can understand and enjoy. In making a point some times words alone aren’t enough. A cartoon drawing communicates! 你的命运由你自己选择! 闪光漫画网络由一连串漫画展示‚ 引领你进入必须步骤而达致明智选择。 我们选择漫画图像的原因‚ 是因为漫画是一个人人能懂和喜悦的语言。 有些要点单靠文字不足表达‚ 而漫画绘图却恰可传达! By using cartoon art we have sought to make spirituality simple and fun. Phil Spratt, the cartoonist comments, ‘It is said that cartoons cause people to laugh for 5 seconds and think for 5 minutes”. We trust the cartoon characters will help you do just that! Step 2. Click here for a PDF in Simplified Chinese to learn how Jesus can meet your needs. Step 3. Click here for a PDF in Simplified Chinese to learn how you can be free from emotional baggage.